Paragliders stay airborne longer by seeking out hotspots of warm air called thermals. Since heat rises, this air boosts us higher each time we make contact. Local weather conditions, therefore, play a very large part in how long a paragliding flight will be sustained. Cape Town and the surrounding landscape enjoy a naturally warm climate, with plenty of thermal pockets to hit. Whereas the length of many paragliding sessions is in the neighbourhood of 5-10 minutes, its not terribly uncommon for flights here to last as long as half an hour (sometimes even more!) under the right settings. Youd be hard pressed to find a better value. 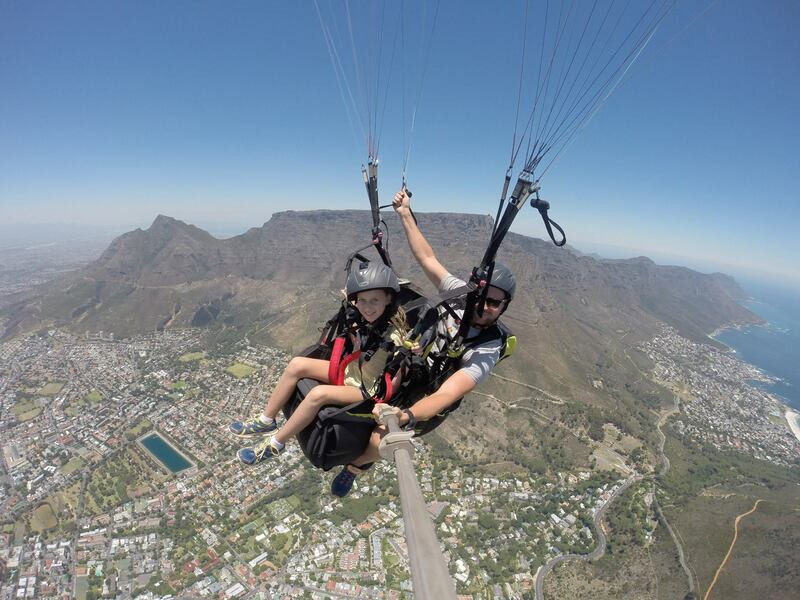 From the sandstone peaks of the Twelve Apostles to the distinctive architecture of the City Bowl and Cape Town Stadium, to the white sands of Camps Bay, paragliders in and around Cape Town are treated to a fantastic feast for the eyes. Where else could you take in a sprawling, panoramic, unobstructed view of such natural and man-made beauty? The mountains that form the backdrop to Cape Towns cityscape  including Lions Head and Signal Hill  make for a perfect launching point, and even the trip up is packed with gorgeous scenery. But why hike back when you could take to the air? Soar far and high over the capital of the Western Cape before setting down on the balmy Atlantic coast. Were thrilled to provide first-timers and veterans alike with an airborne experience that theyll never forget. Most people like to start with a single tandem paragliding flight, to get a taste for the sport, but if youre interested in going further, Fly Cape Town offers a number of paragliding courses and speciality training services. Our pilots and instructors have many years of experience and couldn’t be more passionate about what they do. Whether simply getting your basic license, or furthering your expertise with cross-country and acrobatics training, we are more than happy to share our knowledge.